I realised that the last time I posted something was late August (shame on me). 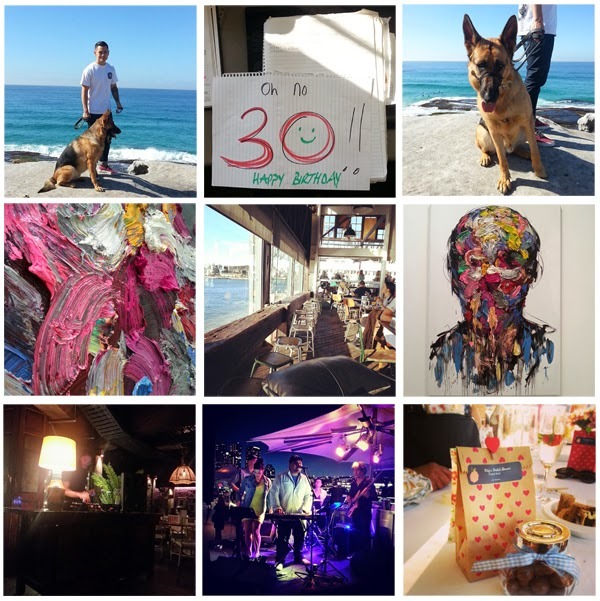 So below is a collection of images via Instagram of what went down during September, namely, my birthday... Booyah! My dirty 30 was not so dirty- quite tame actually. The first day of Spring saw Tim and I take Bear on the Bondi to Bronte Beach walk- he lost his sh*t when he jumped out of the car. It was his first time leaving the west and entering the fresh beach air of the east. Toward the end of September it was an art, music and bridal shower love fest. Carriage Works had a brilliant contemporary international art fair. My friend Marc DL had a DJ set at The Argyle in the Rocks and one of my best mates, Luke, his band Pocketful of Soul performed at the Opera Bar in Circular Quay.